Transit • Sugar House Streetcar a success, say officials, as a magnet for housing, business. 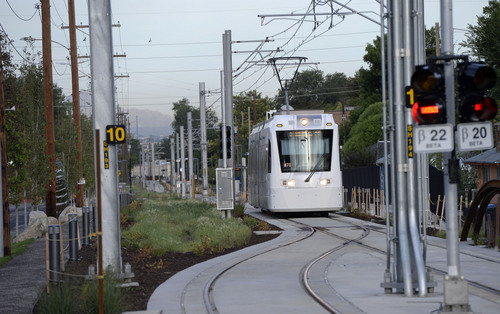 Al Hartmann | The Salt Lake Tribune The Sugar House streetcar nears the end of the line at Fairmont Park Wednesday August 13, 2014. It is only slightly faster than the nearby parallel bus, and pedestrians sometimes can outrace it. Far fewer people than projected are riding it. And it was expensive, $37 million. But officials still see it as a success and worth the price because of the economic development it has attracted. Al Hartmann | The Salt Lake Tribune The Sugar House streetcar stops for a car steaking by on 700 East Wednesday August 13, 2014. It is only slightly faster than the nearby parallel bus, and pedestrians sometimes can outrace it. Far fewer people than projected are riding it. And it was expensive, $37 million. But officials still see it as a success and worth the price because of the economic development it has attracted. Al Hartmann | The Salt Lake Tribune The Sugar House streetcar stops for a car steaking by on 700 East Wednesday August 13, 2014. It is only slightly faster than the nearby parallel bus, and pedestrians sometimes can outrace it. Far fewer people than projected are riding it. And it was expensive, $37 million. But officials still see it as a success and worth the price because of the economic development it has attracted. 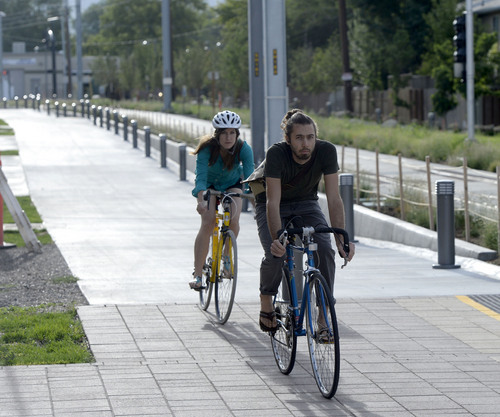 Al Hartmann | The Salt Lake Tribune Bicyclists ride along the pedestrian-bike trail that runs parallel to the Sugar House streetcar line near the 500 East stop Wednesday August 13, 2014. The steetcar is only slightly faster than the nearby parallel bus, and pedestrians sometimes can outrace it. Far fewer people than projected are riding it. And it was expensive, $37 million. But officials still see it as a success and worth the price because of the economic development it has attracted. Al Hartmann | The Salt Lake Tribune Folks climb aboard the Sugar House streetcar at the 900 East stop Wednesday August 13, 2014. It is only slightly faster than the nearby parallel bus, and pedestrians sometimes can outrace it. Far fewer people than projected are riding it. And it was expensive, $37 million. But officials still see it as a success and worth the price because of the economic development it has attracted. The new Sugar House Streetcar is only slightly faster than a nearby parallel bus route, and even pedestrians can sometimes outrace it. Far fewer people than expected are riding the fresh two-mile line that cost $37 million to build. 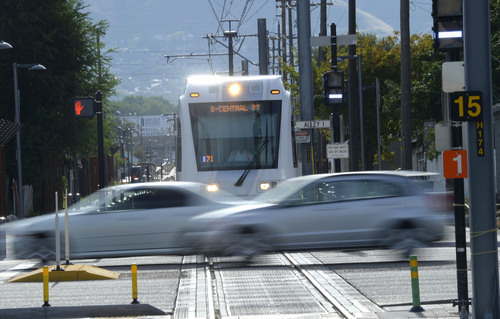 But Salt Lake City and Utah Transit Authority officials still view the streetcar as a success and well worth the price for one main reason: It delivers economic development up and down the line. "The amount of community investment that has occurred will make this streetcar an excellent return on investment," says Robin Hutcheson, the city&apos;s transportation director. "In Sugar House, we&apos;ve calculated there will be about 1,000 new housing units within a short distance of the streetcar line," says D.J. Baxter, executive director of Salt Lake City&apos;s Redevelopment Agency. "There will be about 1.8 million square feet of new space that includes residential, retail and office. It totals a little over $400 million." In neighboring South Salt Lake, Mayor Cherie Wood has said the new line is attracting another 1 million square feet of new retail development, 350,000 square feet of office space and 3,000 new residential units in her city. Michael Allegra, president, CEO and general manager of UTA, told his board last week that the line easily is bringing a 10-to-1 return on investment because of economic development. But the route isn&apos;t proving as successful in terms of ridership and efficiency. Speed • The streetcar takes 12 minutes to cover its two-mile run from the Central Pointe TRAX station to Fairmont Park along an abandoned freight-train corridor. That&apos;s an average of 10 mph. The train runs every 20 minutes and is limited to that frequency because streetcars can pass one another only in one short span of double tracks. Regional transportation plans call for building $900,000 in additional double tracks sometime in the next six years to allow streetcar service every 15 minutes. UTA&apos;s parallel east-west Route 21 bus, about two blocks away on 2100 South, takes 13 minutes to cover the same distance, often making more stops. But it runs every 15 minutes. It also did not require any expensive construction. The Salt Lake Tribune decided to see how long it would take to walk the line. Its 56-year-old, 290-pound transportation reporter took 34 minutes to cover the distance  hitting most traffic lights red on a hot summer afternoon. But that could still beat the streetcar, or come near to tying it, in some instances. For example, if someone just missed a streetcar at the end of the line, that passenger would need to wait 20 minutes for another one and then ride for 12 minutes  a total of 32 minutes, barely beating the old fat guy on foot. If the same rider were traveling just part of the line, perhaps a half or a third of it, the fat pedestrian could cover it faster, depending on how long the wait is for the next streetcar. "It [the streetcar] is not going to win a race," Baxter concedes. "In fact, a strong cyclist probably could outrun it, and we all knew that from the outset." Officials by design wanted a slow-moving streetcar with plenty of stops spaced about every other block. 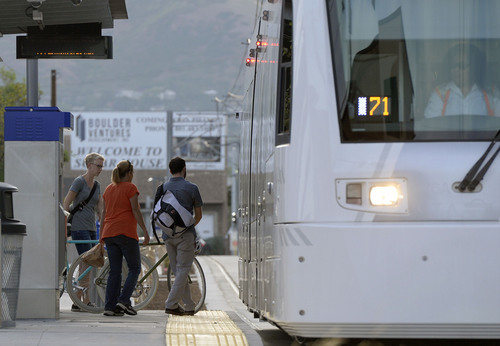 South Salt Lake residents were used to, and upset by, high-speed trains that whisked by their community without serving many neighborhoods, Baxter says. "So the intent of choosing the streetcar was to apply neighborhood-level service that would be permanent, reliable, high quality and stop frequently enough to really serve those neighborhoods." Ridership • UTA data show that the streetcar is averaging 938 daily riders so far this year. The Tribune reporter, returning from walking the route about 3:30 p.m. on a recent weekday, found himself alone on the streetcar for half its route. The federal government expected 3,000 people a day to ride the line when it opened, according to a statement it issued in 2010 announcing a $26 million grant for the project. "We assumed that a lot of the development that you see going in right now would be in place" when the early estimates were made, Hutcheson says. But the recession delayed those projects. "I am really hopeful and am anticipating that ridership will increase rapidly," she says, once all the new housing and commercial space now underway is completed. UTA spokesman Remi Barron says ridership is going in the right direction. "The S-Line streetcar is doing well, as ridership has been increasing since it opened last December. We expect it to further increase when the adjacent trail is complete and all of the planned development is in place." Barron provided some estimates about ridership on the parallel Route 21 bus. UTA estimates an average of 752 people board the bus daily between Central Pointe and 1100 East. The route carries more than that overall, because it travels all the way to the University of Utah. The Tribune asked some riders about why they prefer one transit mode over the other, even though they operate near each other. One  "dead man" was the only name he would give  says he chooses the bus for travel from TRAX to 1300 East because "the bus drops me right across the street from work. I&apos;d have to walk several blocks if I took the streetcar." Heidi Gomez takes the streetcar "because it&apos;s always on time  the bus, not so much" depending on traffic and weather. It also drops her a bit closer to home. Gomez says she&apos;s never seen more than 15 people on a streetcar, and only four were riding as she spoke. A few minutes later, the Route 21 bus had about 20 passengers. Clayton Bryant says he opts for the streetcar because it costs only $1 instead of the $2.50 cash fare  as part of a temporary promotion  if he pays with electronic media. He says if he boards the streetcar and transfers to TRAX or a bus, he still rides for his original $1. Commuters making choices based on time, cost and convenience "is how the system should work," Hutcheson says, and shows the advantages of having more than one option. "I&apos;m very committed to the idea that our city needs streetcars and buses. It&apos;s not an either or proposition. Streetcars do some things really well, like leverage the initial investment for community development," she says. "Buses are very flexible. They can change routes." Development • Officials say the streetcar has far more pluses than the bus in attracting economic development  and they point to the growth in Sugar House since the streetcar began construction. "Since rail is a permanent transit service," says UTA&apos;s Barron, "developers see it as an added benefit when leasing new residential units and retail space." Baxter adds that the permanency removes some risk for developers. "The fact there are tracks in the ground means that your stop is going to be served and the route will not vary. There is absolutely no question where this line will take you," he says. "But, with a bus, routes can change formally, and they can be detoured on a daily basis. There is always some uncertainty." He adds that commuters and developers are attracted to rail lines because they tend to be easier to use. While he says seasoned transit riders have no problems handling bus detours and figuring out transfers, "For a large number of casual riders or first-time riders, I think they are always going to be more comfortable riding the train than they are a bus because of the uncertainty." Hutcheson says attracting economic development is a big reason the city likes the streetcar, is planning an extension and is considering other streetcar lines, including downtown. "The best transportation investment is very good at moving people and providing transportation choice. It&apos;s also good at leveraging additional investment and improvement in the community," she says. "Streetcars are very good at doing this." Sugar House Streetcar • Time: 12 minutes (10 mph). Frequency: Every 20 minutes. Cash fare: $2.50. Construction cost: $37 million. Route 21 bus. • Time: 13 minutes. Cash fare: $2.50. Frequency: Every 15 minutes. Construction cost: $0. Tribune reporter on foot (56 years old, 290 pounds) • Time: 34 minutes (but can nearly beat streetcar in some instances, depending on train wait times). Frequency: Anytime. Fare: $0. Car (at rush hour) • Time: 5.5 minutes. Frequency: Anytime. Fare: cost of car operation.